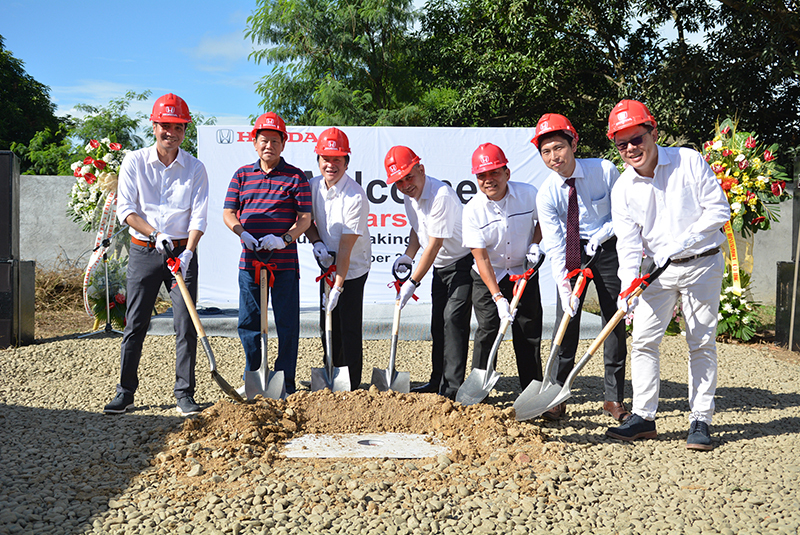 Honda Cars Philippines, Inc. (HCPI), Honda’s automobile business unit, has held a groundbreaking ceremony in Bulacan last December 20, 2016 to signify the start of construction of the second Honda car dealership in Bulacan, Honda Cars Baliuag (HCBG). Honda Cars Baliuag will be located at Doña Remedios Trinidad National Highway, Baliuag Bulacan and will sit in a total of 3,648 square meters with 40 meter frontage lot area. HCBG will offer Honda’s full vehicle line-up in their dealership as well as services of preventive maintenance and general repairs. In attendance during the ground breaking ceremony were: Delfin De Guzman (VP & Head, HCPI Corporate Strategy and Planning Office), Norman Millare (SAVP & Division Head, HCPI Customer Service Division), Masanao Kataoka (SAVP & HCPI Adviser for Sales), Mr. Anthony Cheng (Chairman, ANC Group), Dr. Mike Tan (President, ANC Group) and Mr. Francisco Dela Cruz (COO, ANC Group). Inauguration for HCBG is set for the third quarter of this year.